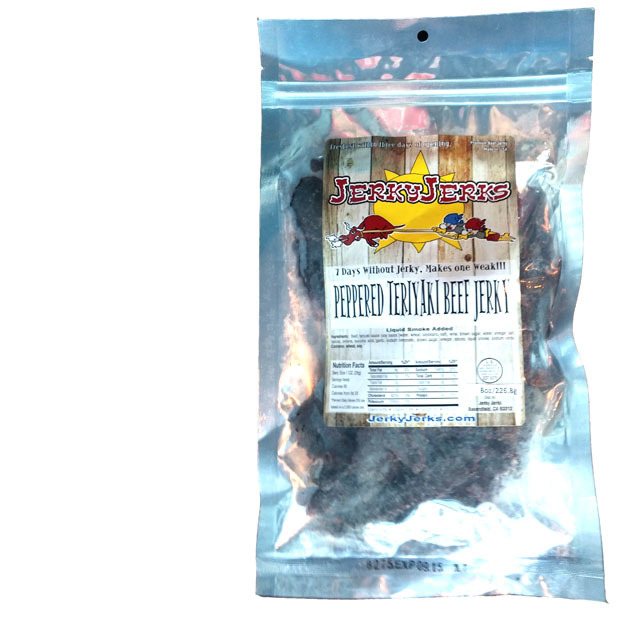 Jerky Jerks is a business owned by Tracy Hood, based out of Bakersfield, CA. It started up selling Jerky Hut brand snacks at trade shows and farmers markets across the USA. These days, Tracy has extended the Jerky Jerks brand to its very own line of jerky. 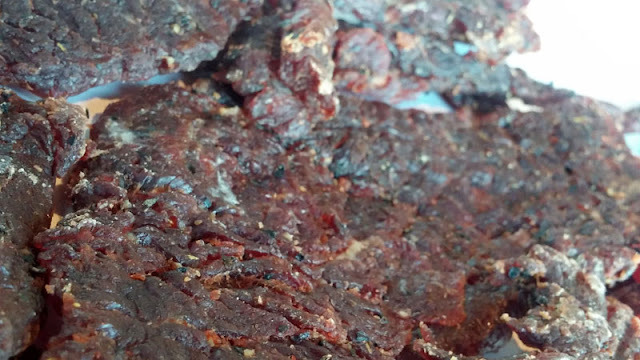 Jerky Jerks is made in a USDA inspected facility and uses no added MSG. This Peppered Teriyaki variety is described by them as having, "...cut thin and tender. Marinated in our signature Teriyaki sauce and then rolled with our own Black Pepper blend of spices." The first flavor I pick up is the teriyaki sauce, along with a lightly spicy seasoning. The chewing brings on some extra sweet, and a light black pepper. I can detect a touch of tanginess. The natural meat flavors maintain a low profile. For being sold as, "Peppered Teriyaki" it certainly holds up. It has a clearly identifiable teriyaki sauce component, noted by its heavy sweet and fermented character. The peppered component is a one-two punch of black pepper and chile pepper. The black pepper remains in the background while a light chile pepper heat is more up front. I'd rate the level of heat as "mild medium" (level 2 out of 5). Otherwise, the primary taste profile is the teriyaki sauce, marked by a strong sweet, with a light level of heat, and a lighter black pepper background. The level of saltiness feels moderate, though the nutrition label shows a higher sodium level. The meat consistency comes in thick sliced slabs, well marbleized, and lightly sticky to handle. They are tender and moist to chew, and once chewed down soft, have a meaty texture, even steak-like, but gummy from the heavy sweet. Some slabs tend to be stringy, others are not. This Peppered Teriyaki from Jerky Jerks delivers its promise of a sweet teriyaki sauce marinade, but throws in a mixture of black pepper and chile pepper for a blend of spice and heat. The teriyaki has an authentic character through the addition of vinegar, but goes extra sauce like a top sirloin served up at a Japanese steak house. I really like the addition of chile pepper to boost the spiciness, and faint bit of tangy chewing. Overall, a more sweet and spicy chew from the standard teriyaki jerky brands out there.